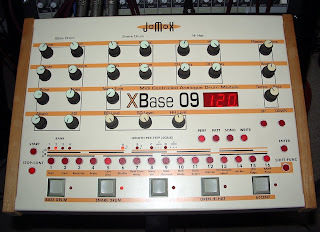 We've slowed down a touch on the rabid gear buying around here at GCHQ lately err....well...a bit at least ;) This sudden tightening of the purse strings didn't quite stop us finally getting our greedy little hands on a Jomox Xbase 09. This little beauty has been on our want list for a while now and we managed to grab one just in time for an Early Chicago house set of samples for next months Future Music. The analogue kick and snare (hats are samples) came in handy emulating the classic sounds of the 808/909. We've uploaded a few bonus beats and some drum hits here and here on our soundcloud page for your sampling/mangling/programing pleasure.